The man fled the area in this gold Chevy SUV. The photo was taken by the homeowner. A man attempted to enter a home in the 31000 block of West Road on March 23 while the resident was in the house, according to Huron Township Police. Chief Everette Robbins says the man tried to enter through an unlocked front door, but the homeowner scared the man away when he came in. 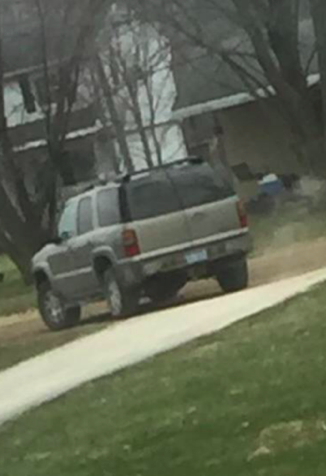 Before he fled, the homeowner was able to snap a picture of the man’s early 2000s gold colored Chevy Tahoe. The man is described as being white with short hair, about five feet, ten inches tall, and clean shaven. He was wearing a black hoodie and tennis shoes. “We are not sure what this person’s intentions were, but we are interested in talking to the owner of this vehicle. If this were a case of a mistaken address, then we ask that the owner contact us immediately. Our Detective Bureau continues to investigate this incident and it is important that this individual get in front of this and come talk to us before our investigation leads us to them,” Robbins said. If you recognize the vehicle pictured above, Huron Township Police ask that you call their Detective Bureau at 734-753-4400. This entry was posted in Front Page News, Police & Fire on March 25, 2016 by Scott Bolthouse. Who’s the retard who waits hours to report,after someone walks into your house……then runs off?